With the BT Video Baby Monitor 2000, you and your little one can both enjoy a well-earned rest. This high-tech baby monitor offers a window to baby’s world, letting you keep an ear and an eye on your child. The portable parent unit has a 2" high resolution colour screen and a long range of 250m outdoors and 50m indoors, so you don’t have to miss a thing. When you don’t want to hear every snuffle, you can turn down the volume and let the sound level lights alert you of noises from baby. 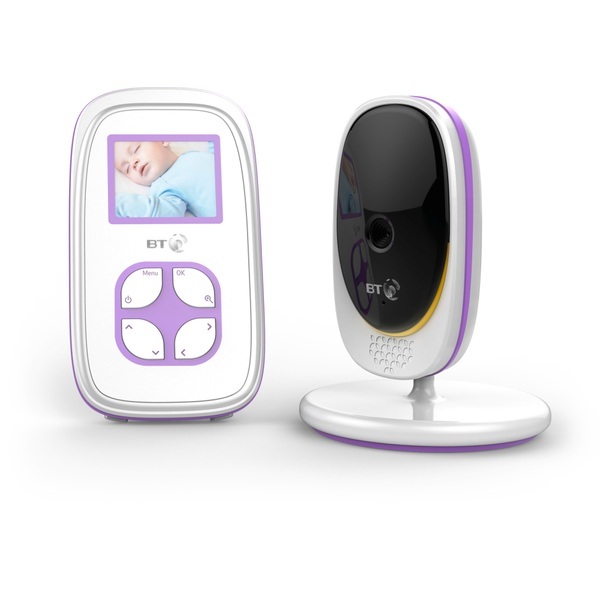 The BT Video Baby Monitor 2000 is equipped with manual pan, tilt and zoom, so you can adjust the camera to focus on baby. This clever monitor system even has infrared night vision, allowing you to watch over your little one even in the dark. This helpful feature ensures you can get peace of mind without disturbing baby’s slumber. The BT Video Baby Monitor 2000 has a helpful indicator to let you know if you move outside its range, so keeping an eye on baby can be even easier. The BT Video Baby Monito 2000 consists of a monitor unit and a portable parent unit, and comes with 2 mains power adaptors and a helpful user guide.